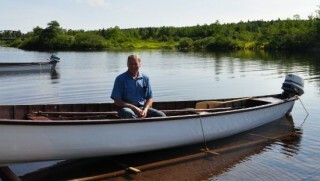 While his father (originally from Change Islands) would have built trap skiffs and punts, Eugene learned how to build the unique Gander River Boat from watching his uncle Nat Gillingham. Eugene has built over fifty Gander River Boats. Typically, he would build one for himself each winter and sell it at the end of the season, but has also built boats to order. One winter, with the help of his son Paul, Eugene filled orders for seven boats – four destined for outfitters in Labrador and three for the United States. A carpenter by trade, Eugene has also spent more than a decade as a guide on the Gander River and other parts of the province. Often alongside his wife Rose, Eugene has worked at outfitter camps at Michael’s River, Eagle River & Eclipse Lake, among others places. This is an awesome and a fabulous video. A secure knowledge of building boats From trap skiffs destined for inshore fishing in Newfoundland and Labrador to the long and narrow Gander River boats. that are capable to navigate the rivers through fast water, rattles and streams. To possess such carpentry skills to build such masterpieces takes an immense amount of patience, perseverance and logic. From the 25 feet to 35 feet trap skiffs to the charm and grandeur of the river boats, the carpentry skill is alive with new ideas, molds and life. Being a son of a carpenter/ trap skiff builder, I know the toils of cutting proper timbers, gunnel sticks, the shape of the proper trees that will make the best planks. Use the big rotary to saw plank sticks to the desired thickness, to dry these green planks in the sun for a few hours until the desired dryness is reached. I am not a carpenter, but had helped my Dad and his brother to build a couple trap skiffs in the mid 70s. I praise and give Thanks to people like Eugene Saunders who give their time and love to construct a living object to be worshiped and cherished by those whose appreciation is second to none.